In this post I am going to cover the framework of combat and experience points in the Numenera game. Combat in Numenera is similar in nature to many other d20 based systems whereby you need to meet or exceed a target number, in this case the task difficulty number, to successfully inflict some form of damage. As with skill based tests a player may spend points from the appropriate pool to help decrease the difficulty. The use of points to decrease the task difficulty number is based on the assumption that a character might spend more time and energy in completing or formulating a strategy, thus the decrease in the difficulty number. I know that this might be hard for some to wrap their head around, but think of it as reaping the benefits of thought or energy spent to make the attack. It is possible to reduce the difficulty number down to 0. If that does happen, then no dice is rolled and the damage is automatically dealt. Let’s talk about damage. Damage in Numenera is a static number. Meaning that you do not roll to determine how much damage is dealt. Each weapon type or class and even abilities have a set damage number that is dealt to the target of the attack. For example if two characters hit the same monster using different weapons, but from the same weapon class (medium for example) they will both deal a predetermined number of damage points to the target. Now, just because you have hit a creature or other such object and your weapon or ability does say 4 points of damage doesn’t mean the creature takes all that damage. Many things in Numenera has some for of armor or nano technology that will reduce the damage of incoming attacks. This goes for the players as well. The armor rating is deducted from the damage total and any remaining damage is then applied to the target. Some characters and creatures have innate abilities or even cyphers and artifacts that grant abilities to the user. These abilities can and in many cases will be able to be used as offensive weapons. Weapon-like abilities will define the cost in pool points and from which pool those points will be subtracted from. Additionally, it will define the type and amount of damage dealt when used. Some technology can also be used defensively as well. For example by providing a short-term or even longer armor ability to the user. Nano technology, cyphers and artifacts are indeed mysterious and fun! Finally when damage is applied, it is taken by reducing the appropriate pool. As pools deplete to zero, nothing good can come of it. That is how players die, reducing the three pools to zero means death! When if comes to creatures and other beings, they have a health rating and once that rating is reduced to zero, they will also die. It”s pretty straight forward. Experience points (XP) in Numenera are unlike anything you are likely to be accustomed too. XP is NOT gained from defeating monsters. No, it’s gained by exploring the world of Numenera. Many XP points will come from DM intrusions. The DM intrusion mechanic is very interesting and creates a bit of chaos that is both exciting and will keep player on their toes. Intrusions occur under one of two conditions. The first condition has already been address in a previous post, but as a recap, if a player rolls 1 on roll the DM gets to intrude and adds a twist to the story, but at no benefit to the player. The other condition is when a task would normal not require a roll due to a character being skilled in a task or test, or if pool points were spent to decrease the task to 0. The GM could intrude add a twist to the story scene. To do so, the GM gives the player the option to allow an intrusion or not. 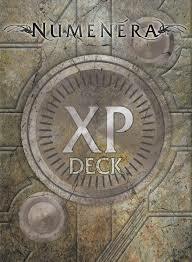 If the player accepts the intrusion they are given 2 XP, but one must be given to another player at the table. If a player declines they would give up an XP point. Intrusions, when allowed, basically create a situation where there is now a chance of failure, even if it is remote. XP can be spent or used to benefit the player in two different ways. The first, the player can spend an XP to reroll any die roll. The second use is for purchasing different development areas. When points are spent in these areas (each can only be purchased once per tier) they begin to grow and develop as a character. Once four of the areas are purchased with XP a character earns the benefits of the next tier up. Each tier gives the character new abilities and developmental enhancements. Previous Post RPG Stomping Grounds – Where Do You Get Your Fix? Next Post DRM Free PDFs – How Do You Use Them?